Manufacture of pre-filled syringes requires the highest quality inspection processes. Traditional automatic inspection systems are cumbersome and complex. The latest technology allows you to benefit from high accuracy inspection in systems that have been designed specifically with your needs in mind. The CMP SA12J has been designed specifically to bring high accuracy and high speed to visual inspection of a range of a range of diameters of pre-filled syringe. Requiring only standard single phase power at 230V and 6 bar air line, the SA12J is easy to install and configure, and yet offers an impressive 200 pcs/min throughput for maximum efficiency, handling all diameters up to 14.45 mm. In standard configuration the CMP SA12J inspects for contaminating particles, fibres, and glass; assesses correct filling level; checks for flange defects before the main turret; stopper control and cap inspection. Optional elements can enable product colour assessment, flange defects after the main turret and leak detection, meaning you can tailor the SA12J to your exact requirements. CMP Pharma (http://www.cmp-pharma.it/) produces inspection machines to detect defects, cracks, pinholes and black spots in ampoules and vials. cracks pinholes and black spots. 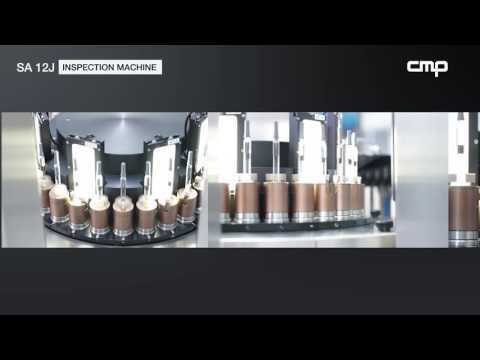 CMP Pharma (http://www.cmp-pharma.it/) produces inspection machines to detect defects, cracks, pinholes and black spots in ampoules and vials.